White, soft, fluffy tail. Slick, soft brown fur plastered to the body ending with spots as white as snow. Why kill such a beautiful creature? Why are they so peaceful and we’re so mean? I wonder how it feels to lose a family practically every day! Well that's what they have to endure. Hunting makes their problems worse! DONT HUNT. Imagine for a moment that there was a war, but not just any old war….. There is a new animal, and the war is about what name the animal should have. 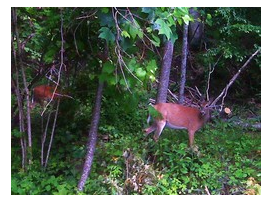 One side is white muzzled deer and the other is white tailed deer. Which side are you on? The war is over. White tailed deer won! Well that’s not exactly what really happened. “ White tailed deer “refers to the underside of the deer's tail, which displays-or goes up- when on alert." White tailed deer are very smart creatures. When the females go for food they leave their baby in tall grass to protect them from predators. The baby lays with its neck outstretched and its fur blends into the forest floor. The babies are called fawns. 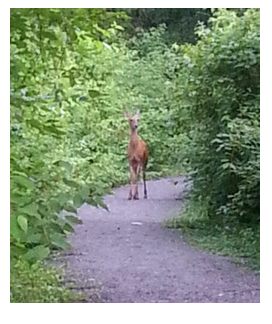 The male adults are called bucks. The female adults are called does. Fawns are weaned six weeks after they are born. Females stay with their mom for two years, while males only stay for one year. 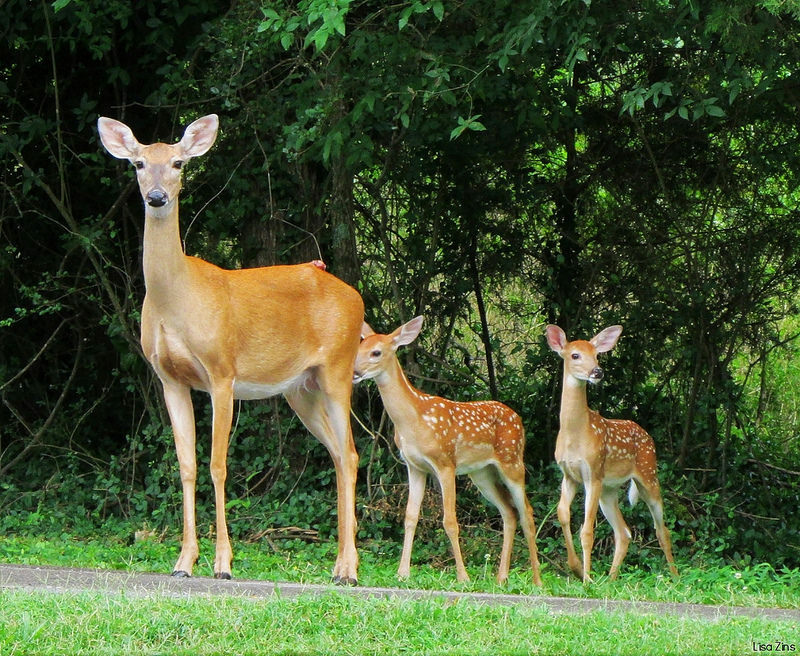 Fawns are often preyed on by: bob cats, cougars, mountain lions, and other big cats. A normal life span is about 2-3 years. Fawns are born in spring. 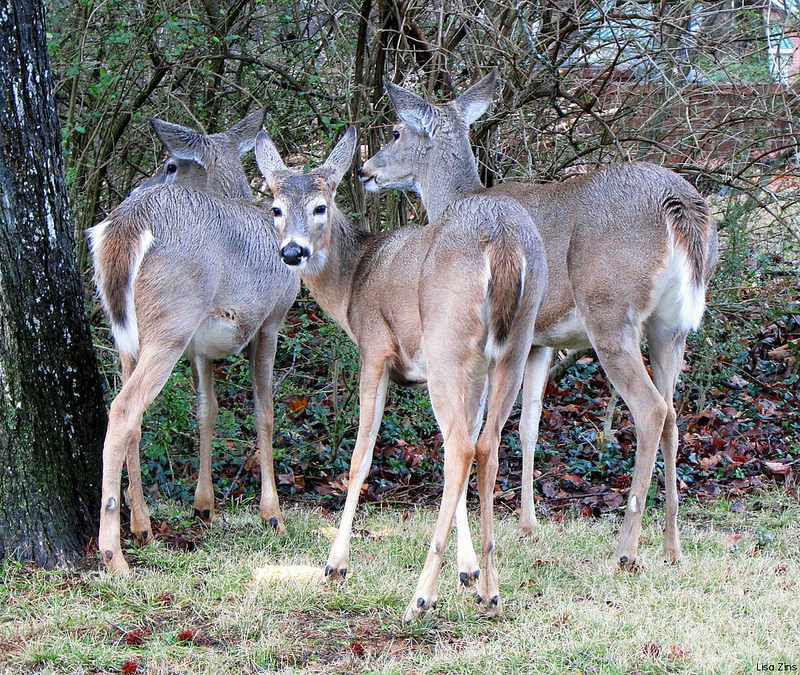 Adult white tailed deer have certain things that they do different than fawns. When they are grown, they have reddish-brown coats in the summer and duller grayish-brown in winter. Antlers grow naturally when the deer is old enough, then in spring, fall out. Only male deer grow antlers. The antlers are not used as weapons, but they are used to fight over does. White tailed deer can live in many different places. White tailed deer's habitat ranges from Canada to South America. They usually live in forests or big areas of trees. White tailed deer-in cold weather- will shelter under the trees, where they are covered by a canopy of leaves, hidden and warm. In the summer-however- they do go and graze in fields of grass. White tailed deer are quite interesting. They are herbivores. They live on a diet of: twigs, fruits, nuts, grass, corn, alfalfa, and even lichens and other fungi. Buds of maple, sassafras, poplar, aspen, and birch. They are nocturnal or crepuscular, which means they dine at dawn and dusk. White tailed deer can run up to 30 mph, leaping 30 feet in length and 10 feet high!!! White tailed deer have good sight and hearing. They are also good swimmers. 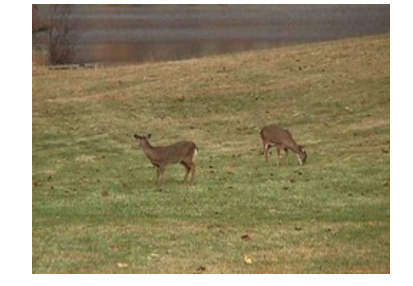 Imagine for a moment that you are a white tailed deer grazing. Suddenly….BOOM! You hear a shot. Your tail goes up, and you zoom away. Then you feel pain in your side. You fall down and that's all you know. Well that’s what really happens to white tailed deer! White tailed deer were endangered because of hunters hunting them, but because hunters don’t hunt them so frequently anymore, they are okay for now. That is why it is so bad to hunt, especially for the animal being hunted. Did you know that the white tailed deer is the most popular large game in the USA! Deer are attracted to light, so they easily get run over by locomotives. So for everyone who likes to hunt, please stop! White tailed deers lives are in our hands. If they get back to being endangered, then maybe even extinct, it will be our fault! But if hunters stop hunting them, and people stop while deer are in the road, white tailed deer might not be endangered again, or at least it will help them a little more.